“The fifth generation of mobile telecommunications (5G) is the successor to LTE. It will support a very broad spectrum of applications: End users can enjoy enhanced mobile broadband with more than ten times the data rates of LTE. It is, however, the communication between machines rather than humans that lies at the core of 5G. It will enable the connectivity and reliable control of cars, minidrones, and robots, to give some examples. 5G also intends to be the technology of choice for the Internet of Things, connecting millions of small devices in an energy-efficient manner. The worldwide standardization of 5G is expected to be finished in the year 2019. Prototypes of mobiles already exist today but are in the size of a suitcase. It is expected that manufacturers will provide network equipment and handhelds by 2020. First networks will go online soon after. From a technical point of view, 5G will employ antennas with hundreds of antenna elements to exploit massive MIMO for improved capacity as well as new carrier frequencies including millimeter wave communications. More and more network functionalities will be implemented in software rather than hardware, using software-defined networking and network function virtualization. A low latency of about one millisecond will be offered as an important requirement for realtime applications. Austria now gears up to become a hub for this new technology. The country’s first test region, the “5G playground Carinthia,” will be established soon. It will cover selected industrial areas in Austria’s southernmost province, including the Lakeside Science & Technology Park in Klagenfurt adjacent to the university campus. Companies, startups, and research organizations can get access to the playground in order to test and develop their prototypes, products, and applications in a 5G setting. Austria’s ministry for transport, innovation, and technology and the government of Carinthia are providing 1.6 million Euros, as presented to the public in a press conference in Vienna this week. The Austrian Research Promotion Agency (FFG) will further promote research on 5G applications with five million Euro in the coming years. Austria gears up to become a 5G hub, establishes a 5G playground. Infrastructure minister Jörg Leichtfried, Gaby Schaunig, vice governor of Carinthia, and professor Christian Bettstetter from the University of Klagenfurt explained the purpose of the 5G playground, benefits for the region, and specific project ideas. 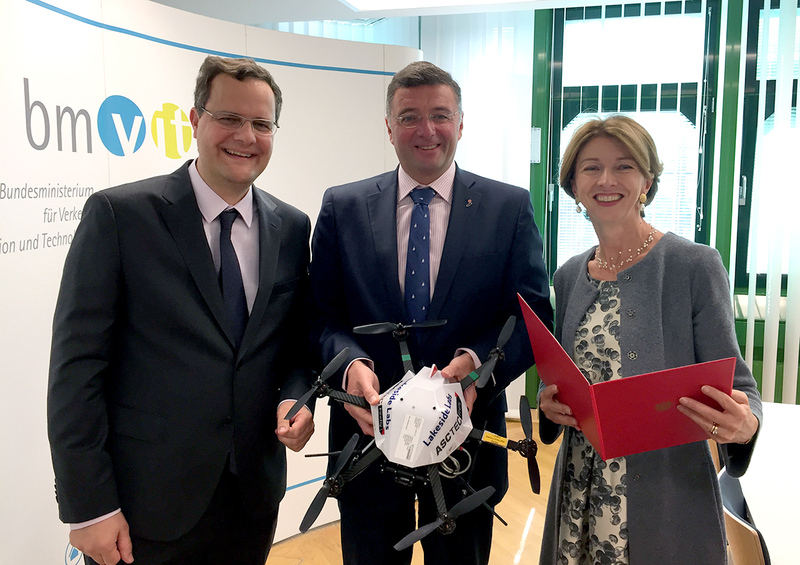 “I want Austria to be recognized as a pioneer for the new mobile radio standard 5G in Europe, which is why we launch the first 5G test region today: Carinthia will be a great playground for local companies to test the new technology in practice, for example, in self-driving cars, intelligent rescue drones, or networked robots. This will strengthen the location and bring well-paid jobs to Austria,” says Leichtfried. Schaunig adds: “The 5G test region underlines Carinthia’s standing for being an innovative location and enables the early development of products and technologies.” It will provide a competitive advantage to the region. The University of Klagenfurt and Lakeside Labs plan to use the 5G playground to advance their research in networked multidrone systems. They currently focus on three application domains: disaster management, agriculture and forestry, and delivery of urgent goods. “To communicate with drones, WLAN or LTE often do not fulfill the application-specific requirements,” says Bettstetter and adds: “5G has great potential to make certain drone applications much more reliable.” The 5G playground nicely complements existing ICT research projects in Klagenfurt, such as the newly established Karl Popper Science Kolleg on networked autonomous aerial vehicles. “Bettstetter with his Lakeside Labs will play an important role,” Adolf Winkler comments in the regional newspaper Kleine Zeitung. The national newspaper Der Standard, the tech news portal Futurezone, and Austrian television reported as well.